Urofoam® double or single-sided adhesive foam strips are soft, pliable foam strips specifically designed for the unique bonding applications of male external catheters to the skin and are suitable for use with both standard and self- adhering type catheters. They provide a comfortable, air-tight seal that is an effective way to secure a male external catheter to the body. They are easy to apply and remove so when it comes time to change that catheter, it can be changed easily and quickly. 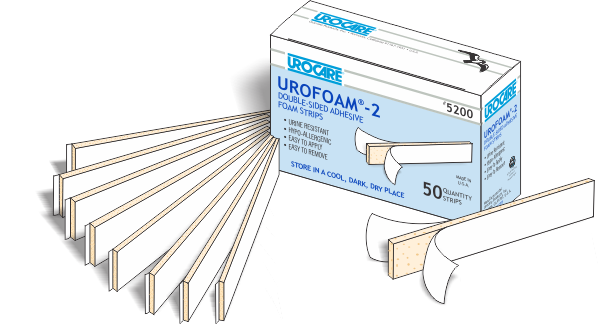 or Urofoam® strips, a male external catheter can be held in place for up to three days—results may vary, but it's nice to know that when you need to depend on an adhesive strip, you can depend on Urofoam®. • Closed-Cell Foam Structure—for an air-tight seal. • Soft and Pliable—Easily conforms to irregular contours of the body. • Urine, Water & Perspiration resistant—It retains it's adhesive qualities even under water. • Easy to apply and Remove—Just peel 'n' Stick to apply, peel back to remove. If the strip is difficult to remove, Urocare® Adhesive Remover Pads may be used to soften the adhesive and assist in the removal of the strip. They contain a non-toxic, citrus-based adhesive remover that may also be used to remove most types of medical adhesive or adhesive residue from skin and appliances or in preparation for use of a new strip. Most medical grade adhesive removers will work basically in the same manner; however, consult your doctor or speech therapist to decide the best product for you and how to use it safely. For more information—see Urocare® Adhsive Remover Pads. In the event of skin that has become sensitive to aggressive medical adhesives, Urocare® has developed Uro-Prep® a protective skin barrier wipe for use under all types of medical adhesives. They protect delicate, sensitive skin from aggressive adhesives often used in conjunction with urinary or ostomy appliances. Uro-Prep® wipes are safe, effective, and for external use only. For more information—see Uro-Prep®. Available Types: Click on item No. for specific item information.